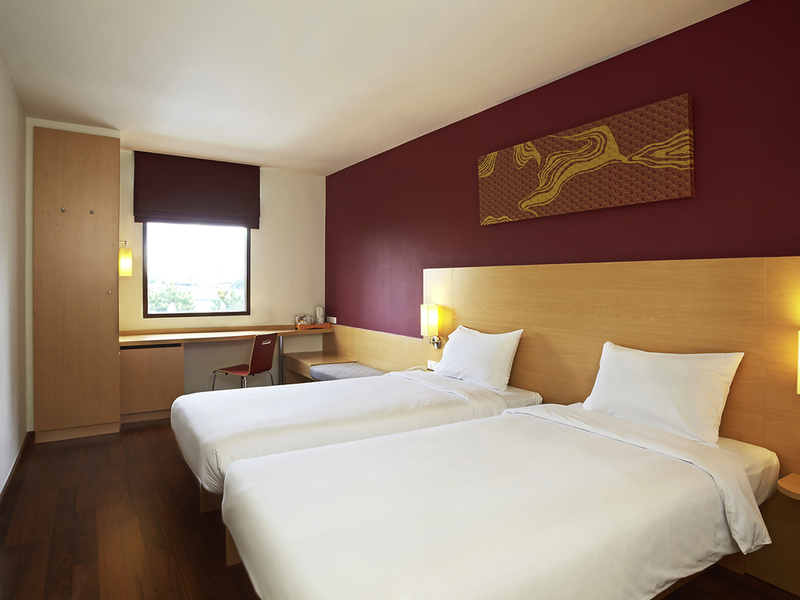 For a relaxed and comfortable stay, Ibis Bangkok Riverside is the ultimate retreat for you. Situated right on the banks of a river, this hotel enjoys a picturesque location and offers old-fashioned yet comfortable rooms. At the hotel, you have a Thai massage parlor as well as a pool. The Thai food at the hotel restaurant is quite a delight as well. On the banks of the Chao Phraya River, in the Khaosan area of Bangkok city, is the Ibis Bangkok Riverside. 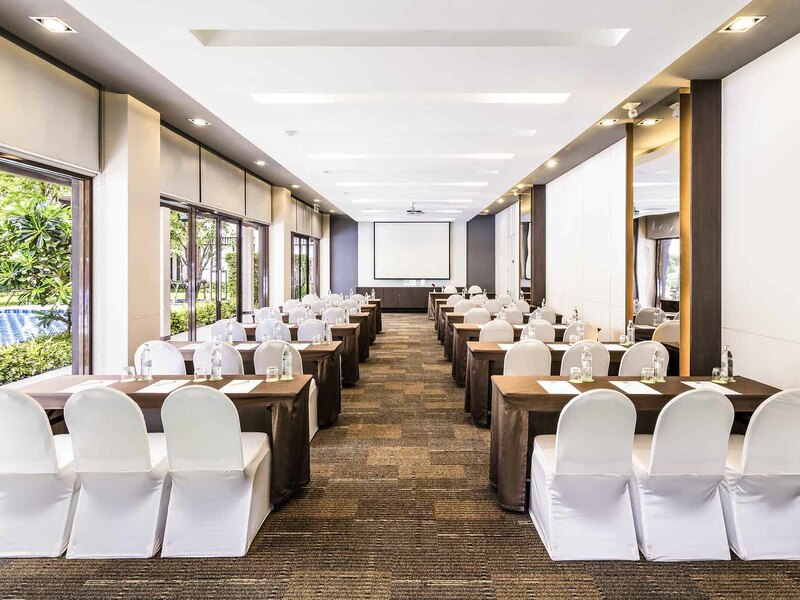 The hotel is located within walking distance of several landmarks of the city such as Bangkok Seashell Museum, Wat Ratchanatdaram, and Taksin Bridge, along with several temples and shopping centers. 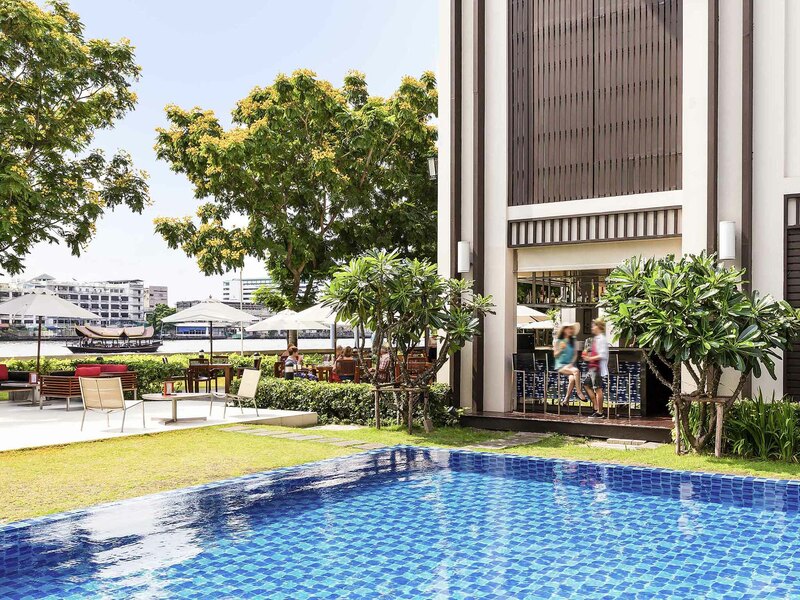 It is easily accessible too with the BTS-Saphan Taksin train station a five-minute walk away making it a popular spot among leisure as well as business travelers. Local attractions around the hotel are The Oriental Spa at Mandarin Oriental, Grand Palace, Central World Plaza, Asiatique The Riverfront, State Tower, Jim Thompson's House, among others. The hotel is adorned in a contemporary architecture housing a variety of luxurious and comfortable rooms to choose from, providing guests with a great holiday experience. The Ibis Bangkok Riverside has 266 rooms on its property. There are twelve family rooms, twelve connecting rooms and three rooms specially designed for people with disability. The hotel is a pet-friendly hotel and a non-smoking property. All the rooms have all basic facilities such as Wi-Fi, Safe deposit box, Work desk, Spa Bathtub, Walk-in shower, Free toiletries, Non-feather pillows, Linen, Coffee/tea maker, Refrigerator, Flat-screen TV etc. 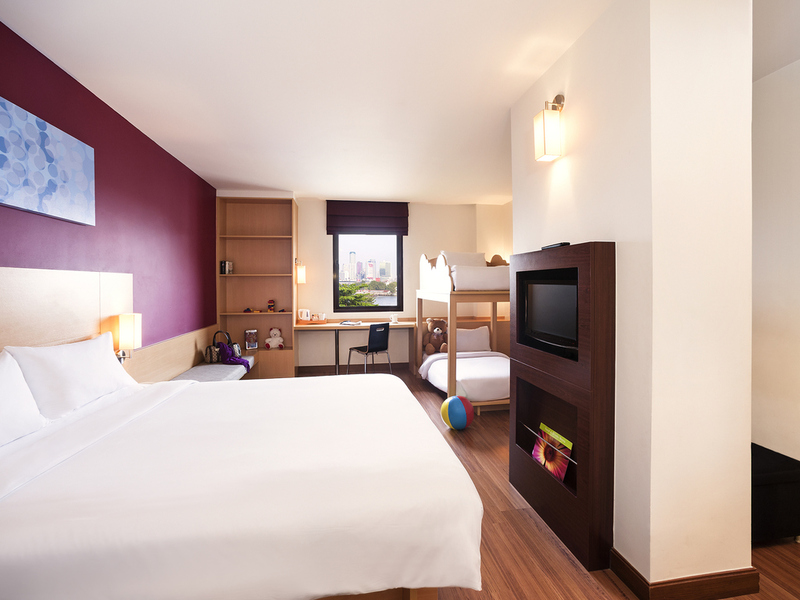 The family rooms are equipped with gaming consoles and kids toys and activities. Extra beds can be provided upon request. 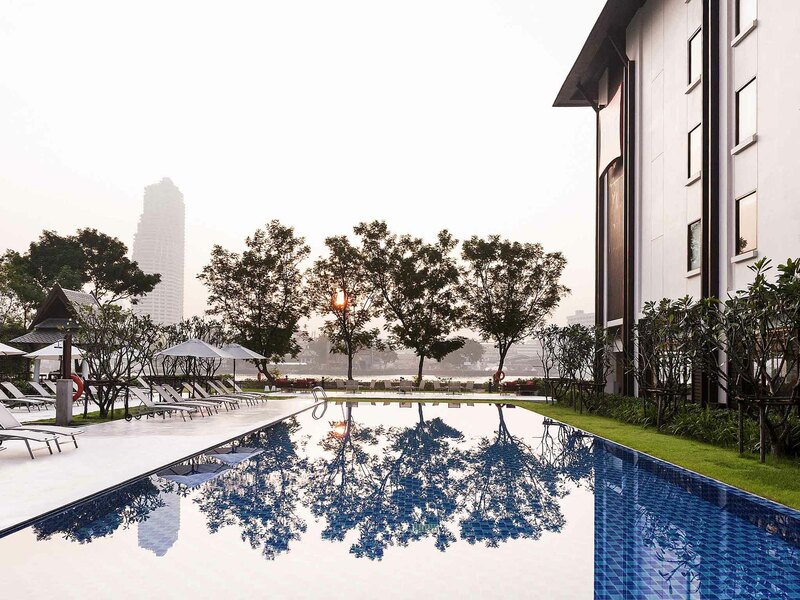 The Ibis Bangkok Riverside has two outdoor swimming pools, one normal and the other heated. The hotel has an indoor swimming pool too. It also has a gymnasium and a fitness center. For a soothing massage, the hotel has a massage center, a spa and a wellness center offering many kinds of exotic Thai massages and treatments. The spa has an excellent sauna too. There is a sun terrace where one can relax and soak in the tropical sun. The hotel is surrounded by a garden overlooking the river where one can have a meal refreshed by the cool river breeze. The hotel also has a provision where one can rent out a car, motorbike or bicycle to explore the city. 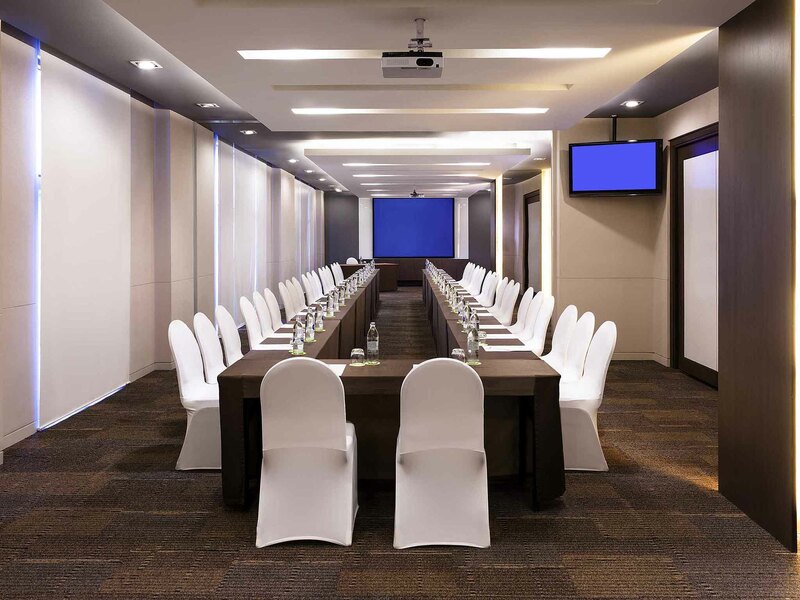 The Ibis Bangkok Riverside has a fully equipped business center and a meeting room where conferences can be held. The Ibis Bangkok Riverside an in-house restaurant called The Taste. The restaurant is well known for its international and Thai fusion cuisine. 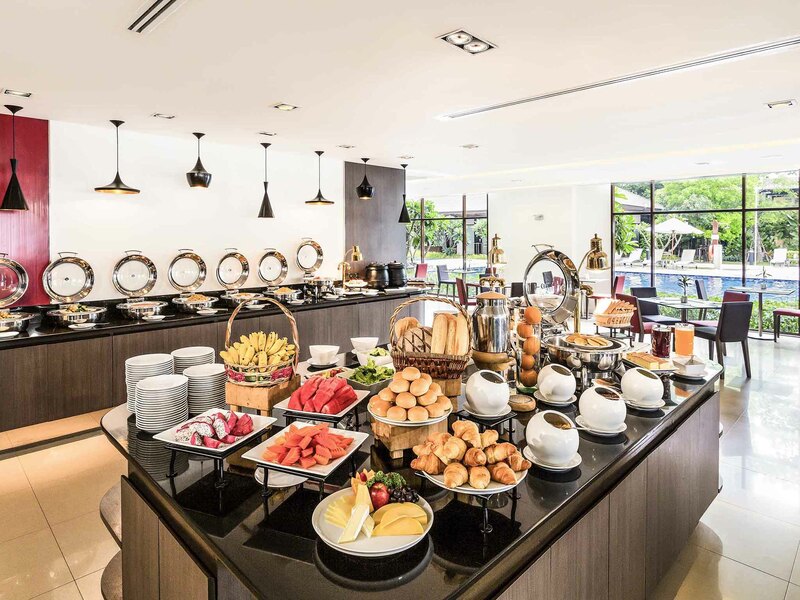 They also have an All You Can Eat breakfast spread which is available to all in-house guests. The hotel also has a bar and lounge in which cocktails and snacks are served through the day. 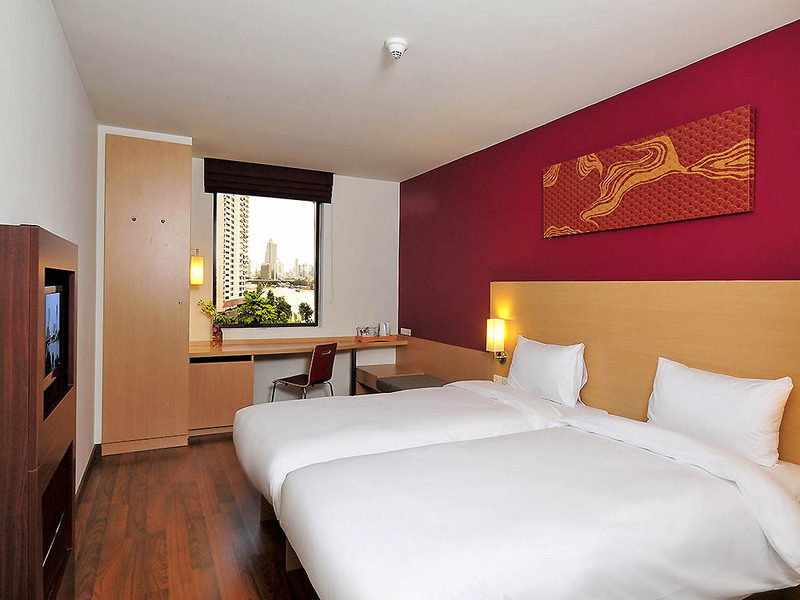 Ibis Bangkok Riverside is an ideal place for vacationers. There is a 24-hour reception desk offering all the required information. The travel desk staff will help guests plan their excursions and trips around the city and even suggests places to visit according to their interests. Which is the closest airport to the hotel? The Don Mueang Airport is at 25 kilometers from the hotel. The hotel provides guests with airport shuttles on request or one can hire a cab as well. What is the check in time and check out time at the hotel? As a guest at the hotel, one can check in after 12 noon and can check out before 2 pm. If one is traveling with a family, what all room options are available? There are many types of rooms at the hotel. One can select one of the family rooms where one will get a double bed and bunk beds. Additionally, one can also book connecting rooms which will give some amount of privacy. What kind of facilities are there at the hotel for fitness enthusiasts? The hotel has three swimming pools, a spa, sauna, health center, and a gym. The health center offers several Thai and exotic massage treatments to guests. 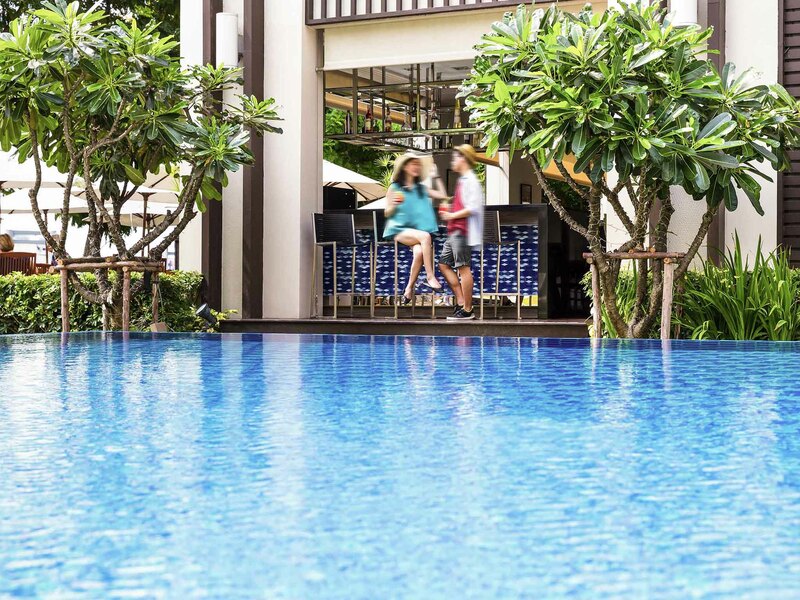 What are the places to visit in and around the Ibis Bangkok Riverside? There are several markets where one can go shopping. One can take a boat to visit the floating markets. There are also several museums and palaces which can be accessed through Bangkoks waterways. 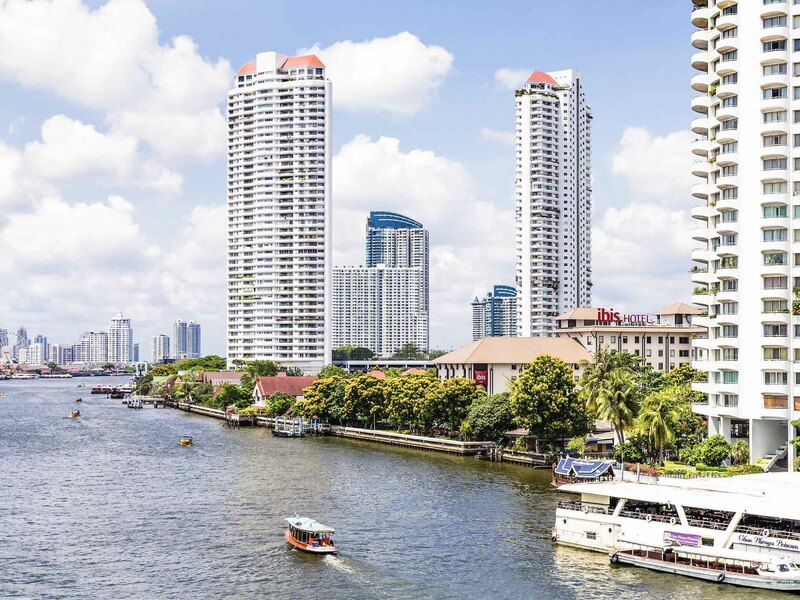 Bangkok is often known as the Venice of the East because of the rivers crisscrossing through the city. This has created a beautiful system of waterways which is the lifeline of the city. People use boats for transport, houseboats to live in and boats to sell their wares too. This has created a kaleidoscope of colors which is interesting and colorful. Many hotels have come up on the river banks, creating living spaces which offer insight into this lifestyle. 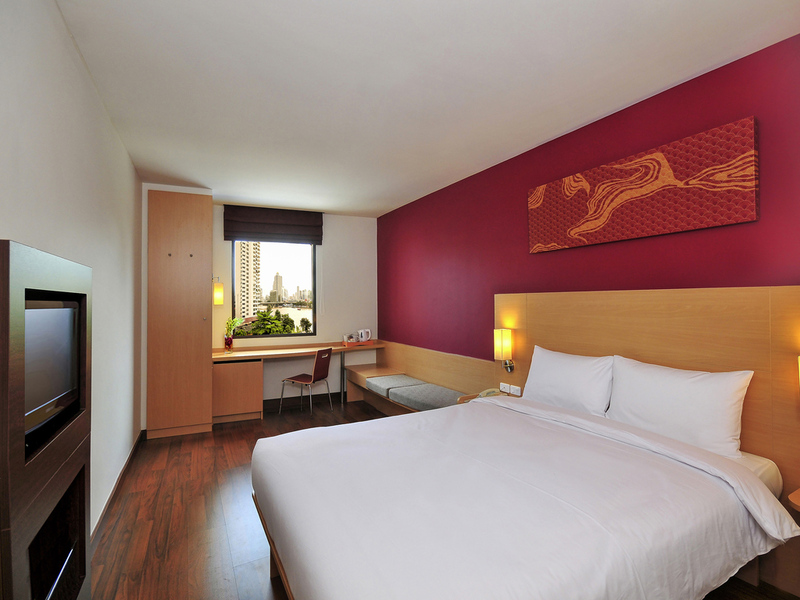 For travelers seeking a luxurious stay on a budget, the Ibis Bangkok Riverside is perfect. The hotel situated on the riverfront has rooms with beautiful views. The garden also on the waterfront makes for an excellent evening of relaxation. 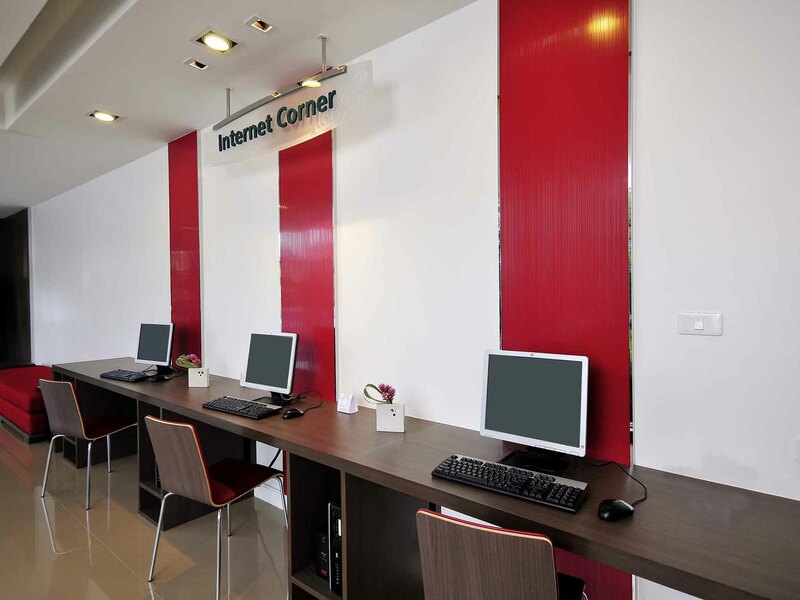 All these and the hotel's proximity to Bangkoks locales make it a perfect choice for all kinds of travelers.